Russia is interested in Cuba improving its relations with all its neighbors, primarily in the U.S., Russian presidential press officer Dmitry Peskov said. "From the point of view of international relations, you know that Moscow has repeatedly and on different levels criticized supporters of sanctions, citing primarily ineffective and deadlock use of sanctions. For this reason, we, of course, can only welcome the refusal of sanctions policies in international relations in general," Peskov told reporters, responding to a question from Interfax as to whether the intensification of the U.S. on the Cuba track raises concerns in connection with the visit by U.S. President Barack Obama t Cuba and whether it is possible to change the U.S.-Cuba relations without lifting the embargo. 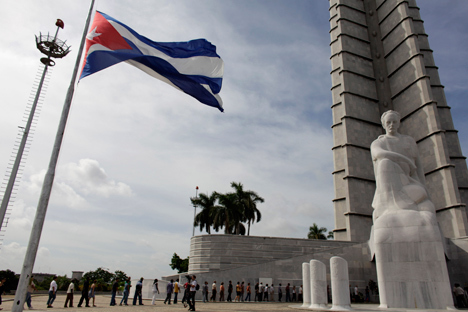 Peskov said Russia and Cuba have a long history of partnership. "Now these relations are gaining a new momentum, there is a lot of room for bilateral cooperation. And of course, we are interested in our friendly Cuba maintaining good relations with all its neighbors, but, of course, with the United States of America in the first place," Peskov said.